JSSI’s Asset Monitoring Platform (AMP) is designed specifically for business aviation lenders as a tool to assist in the mitigation of default risk and the management of financed aircraft. Through access to operating, payment, and maintenance data for their portfolios of financed aircraft, lenders can gain valuable insight into the financial risk exposure of their assets throughout the term of the loan. 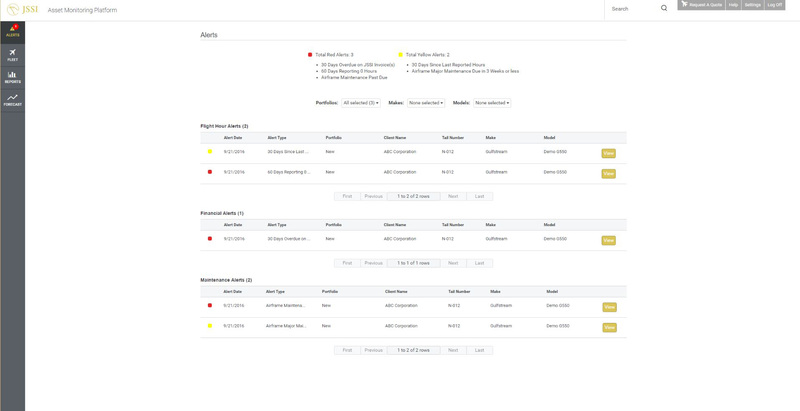 AMP is accessed through a customizable web portal, giving lenders the ability to build and compare defined portfolios of aircraft; establish flight, payment and maintenance activity alerts around individual assets or portfolios; and view asset activity reports. No other tool on the market today can provide the flexibility or insight into your portfolio of aircraft.